The Camp Fire in Northern California has already been the most lethal and most destructive in state history, and it continues to burn. The death toll, currently at 63, is expected to grow — more than 600 people are currently reported missing. The fire has burned through 142,000 acres as of Friday morning, just eight days after it began. It’s not the only major fire in California, either. The Woolsey Fire, near Malibu in the south, has blazed through another 98,000 acres, killing three people. And these fires are just two of the latest in a year when at least 1.6 million acres in the state have burned. There are other fires currently burning, as well. Fires aren’t rare in California, and no one thing causes them. But the fires this season have grown to be big and destructive because a confluence of environmental changes, several related to climate change, have made the state more vulnerable. Those changes include drought, higher-than-average temperatures and population growth near wilderness areas, all of which have created favorable fire conditions, exacerbated the blazes and made them more costly. Here’s a look at how some of these factors have raised the fire risk in California. First, it’s hot, even by California standards. Rising temperatures affect fires in a variety of ways. Most obviously, hotter temperatures dry out the plants that fuel fires. Drier plants equals better kindling, which equals bigger, hotter fires. 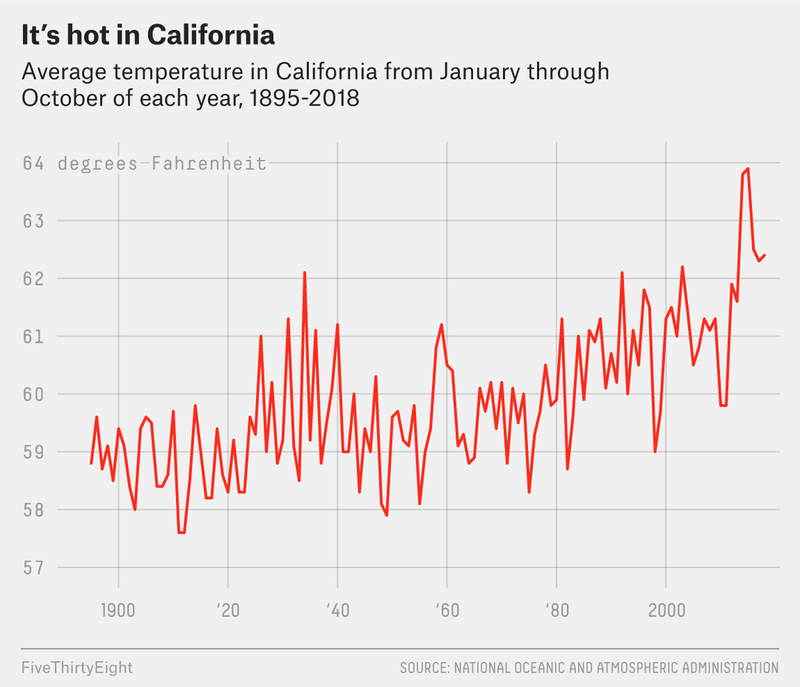 But the relationship between hotter days and bigger fires isn’t just about temperature — it’s also about when in the year the hotter days happen. Spring is coming earlier in California and across the United States, which means a longer, balmier growing season. (This year, winter in Southern California ended a full two weeks earlier than average.) That, in turn, produces even more plant material for the abnormally hot summer weather to dry out later. 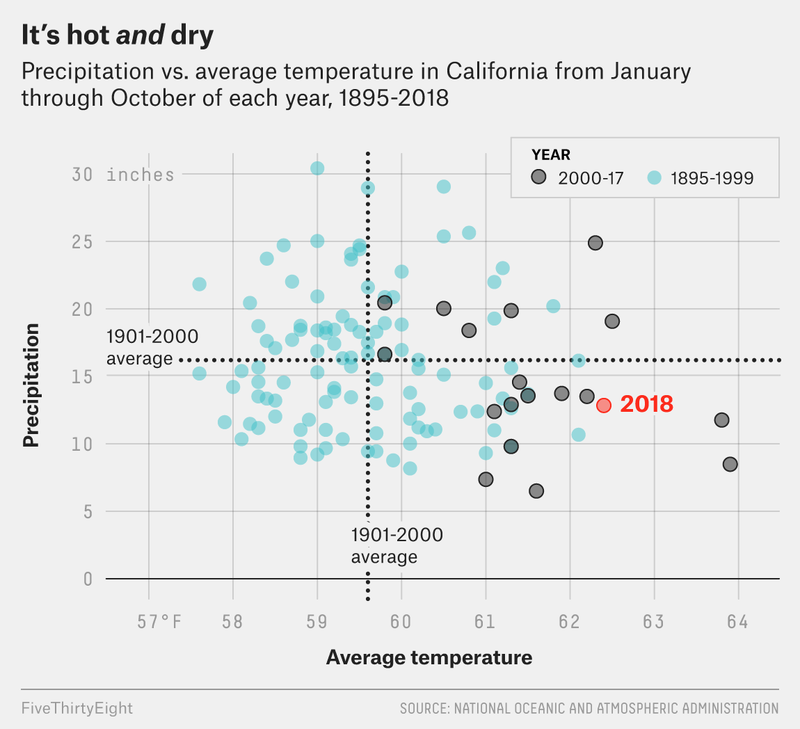 Precipitation also matters, and this year, California has gotten less than usual. But even if California had gotten more precipitation than usual, it’s no guarantee of a calm fire season. Precipitation levels have been all over the place in California this century, and that state, like many places, is expected to get wetter as the climate changes. But, in 2015, when researchers from the federal National Climatic Data Center (now part of the National Centers for Environmental Information) modeled fire risk over time and its relationship to expected climate change, they found the risk went up. Their conclusion: Hot, wet springs are producing enough extra vegetation (i.e., potential fuel) that the state doesn’t actually need to get drier to burn more often. 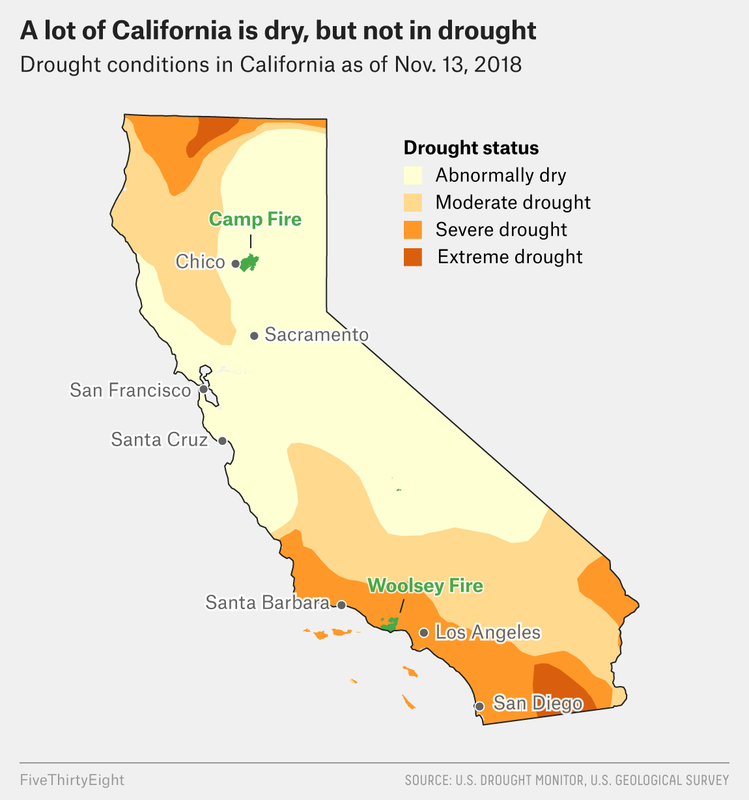 This year, though, California is dry. That doesn’t mean all of it is in a drought, though. While California experienced intense droughts throughout much of the 2000s, most of the state hasn’t technically been in a drought emergency, as declared by the governor, since April 2017. Still, almost the entire state is abnormally dry, and a particularly dry autumn is part of what allowed strong downslope winds to spread fire so quickly in early November. 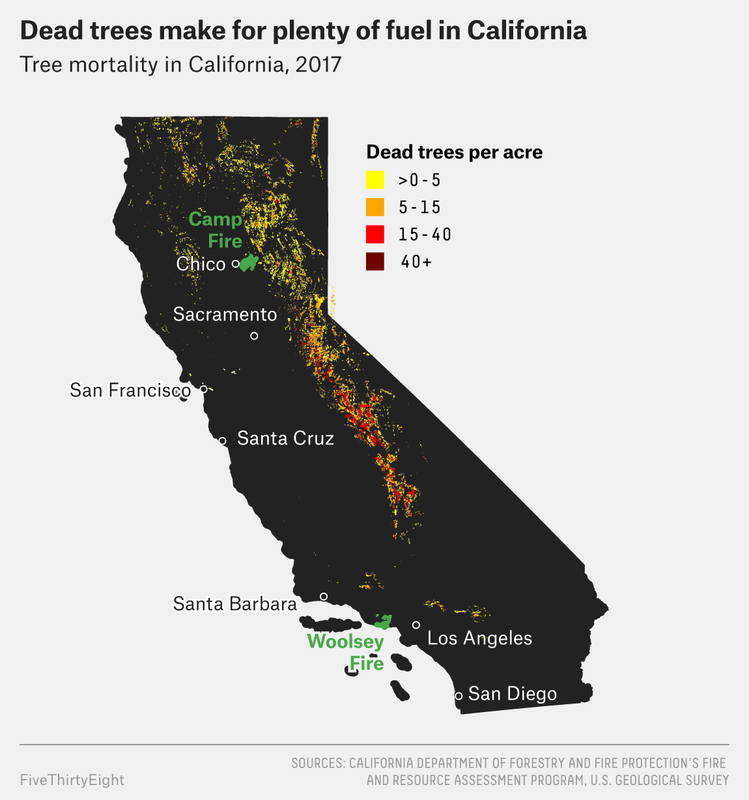 Drought has also led to unprecedented tree mortality in California, largely because of the spread of bark beetle populations that thrived as trees weakened. That’s left a lot more fuel around when fires do start. The tree die-off was so bad by 2015, when the U.S. Forest Service estimated that 22 million trees had died from drought-related causes, that Gov. Jerry Brown declared a state of emergency; an estimated 129 million have now died, according to the most recent Forest Service estimates. “As the climate’s warming, our forests are under increasing stress,” said Chris Keithley, the chief of the California Department of Forestry and Fire Protection’s Fire and Resource Assessment Program. Fire danger is particularly severe in areas where human development meets forests and other naturally fire-prone landscapes, which are highlighted in the chart below. 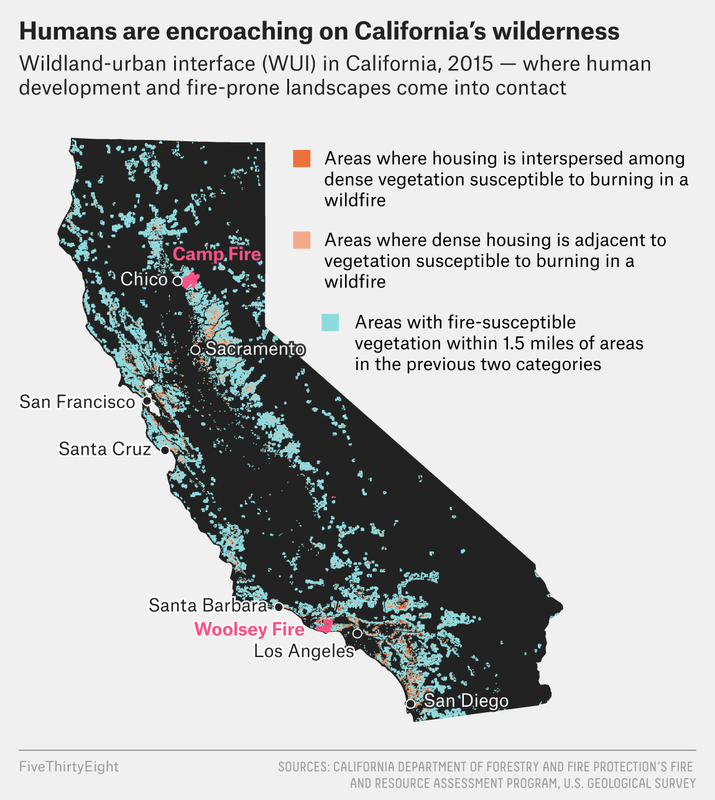 Wildfire experts call this the wildland-urban interface (or WUI, pronounced “woo-wee”). The risk of devastating fires is high in these areas for several reasons. First, fire is a natural feature of these wilderness landscapes, but as development encroaches, fires can no longer be allowed to burn naturally without the town being at risk of burning. As natural fires are suppressed, there’s a buildup of fuel, coupled with an increased chance that a fire will be ignited by human activities. Although these conditions are likely to continue, ever larger and more destructive fires aren’t necessarily a foregone conclusion.